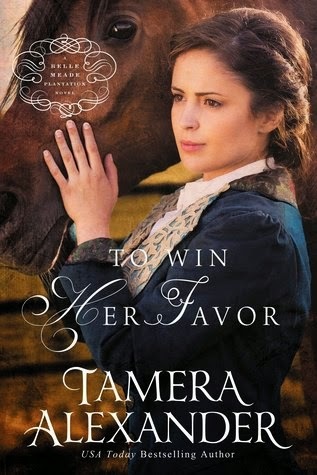 I don't believe that I've ever read any of Tamera Alexander's other books, but after reading this one, I'm going to have to go looking for them, I think. I very much enjoyed this one. What I also enjoyed was checking out some of the other reviews and when I did, I saw one thing repeated over and over again. People have given this book a one star rating due to the intimacy within this book and that puzzles me. Granted, I understand that not everyone is as open about this sort of thing as I am, but the fact that they gave such a negative review for something so natural is baffling to me. They mentioned that it would be a problem for girls and unmarried women to keep their thoughts pure after reading it. I'd like to point out that this book isn't marketed or written for girls or young adults. This is an adult book. Also, let's face it, even in good Christian homes, married couples are often intimate and to pretend otherwise is just silly. Anyway, that's my soapbox for that. The book is very well written, the characters well thought out and I very much enjoyed it and will be looking for her other books. Thank you, Katie, for so eloquently expressing exactly what I've been thinking about those negative reviews. I loved everything about this book and will try to address the intimacy aspect in my review also. Not that it will do any good, though, because people's minds are made up one way or the other. I read so many books that end with the engagement or marriage, that it's refreshing to see one focus on the marriage itself. You would probably like Tamera's first book, Rekindled, which also deals with a married couple. It was my favorite in that series.